When most people hear the words “pet detective” images of Jim Carrey being a buffoon inevitably come to mind. A lot of folks wonder if there even is such a thing as a pet detective, but apparently there is — at least in Nebraska. But this story doesn’t start there. It actually begins in California’s Bay area up San Francisco way. It seems a woman in Vallejo became concerned when her cat Sheba was a no-show for dinner one night. But it wasn’t until the next morning when the indoor/outdoor cat still hadn’t returned to claim its meal that Riley McDermid became really concerned. While Sheba liked to roam, she wasn’t known for pulling disappearing acts like this that amounted to all-nighters. Adopted approximately eight months earlier, McDermid checked shelters for the microchipped cat to no avail. 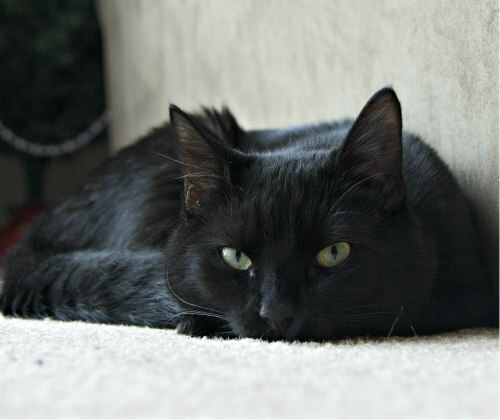 That’s when McDermid began contacting neighbors asking them if they’d seen the small black feline in the past 24 hours. While none of them had, she did receive some interesting news that seemed worth checking into, no matter how far fetched it might be. It appears that right around the time Sheba went missing a next-door neighbor of hers had passed away and his children had come in from Omaha to collect his belongings and settle his estate. That neighbor had three cats of his own, and one of them bore a striking resemblance to Sheba. Could it be that Sheba was taken in a case of mistaken identity? As unlikely as it seemed, McDermid decided to pursue the matter by whatever means necessary. After gathering contact information on the Nebraska siblings that had recently been in her neighborhood, Riley McDermid began her attempts at contacting them through Facebook and text messaging. Not surprisingly, there was no immediate response. In all fairness, the family was probably in the throes of mourning the loss of their father and was either not up to the task of answering the repeated attempts at contacting them at that particular time, or they merely thought they were dealing with a crazy California cat lady. Either way, McDermid got nowhere on her own. She was not, however, ready to give up that easily. That’s when she began to mull over the notion of employing a private investigator, but would anyone take her case? Riley McDermid figured she had nothing left to lose when she started researching Omaha PIs. After three polite refusals to take the case — and probably a lot of head scratching, odd looks at the telephone receiver and snickering on their part after the calls were concluded — the fourth time was the charm. That’s because the last PI was Mona Kay of Mona K. Investigations, who just so happens to be an animal lover herself. While Kay probably didn’t know initially how much luck she was going to have in tracking down an animal that was purported to be over 1,600 miles from its home, she took the information McDermid provided her and ran with it anyway. Thus began Kay’s search for Sheba in Omaha, Nebraska. After doing a bit of research, Kay set out armed with four different addresses in connection to the individuals that might be able to shed some light on this mystery. Her first stop was at the home of a woman by the name of Brittany Hulett. After introducing herself and explaining the reason for her visit, Kay proceeded to produce an image of Sheba that McDermid had provided and asked if she’d ever seen the cat. Shockingly, Kay hit pay dirt on the first try. Hulett immediately told the private investigator that, indeed, Sheba was in her house at that very moment. She retrieved the cat and handed it over to Kay without hesitation. When questioned later about the incident, Hulett said she had no doubt the cat was McDermid’s, “because who would really go to that extreme?” and wondered aloud at the odds of a mix up such as that. 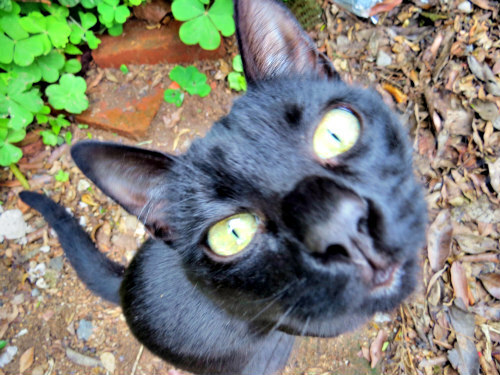 Actually, the odds are pretty good when you have an all black cat with green eyes. That’s why tags, microchips and tracking devices are all a sensible idea to have on your pet so that mix-ups like this don’t happen. If your pet is somehow lost or injured and taken to a shelter or a pound, your chances of recovering them are much higher if you have these kinds of identification devices onboard. Fortunately, this story ended well, but many of them don’t. Mona Kay contacted Riley McDermid with the good news and the pair made arrangements for Sheba to be shipped home. For her part, Kay still marvels at not only the odds of finding the cat so far away from home, but that she did it on the very first try. Sheba is now back with her family and everyone, including Kay — Omaha, Nebraska’s pet detective — couldn’t be happier.